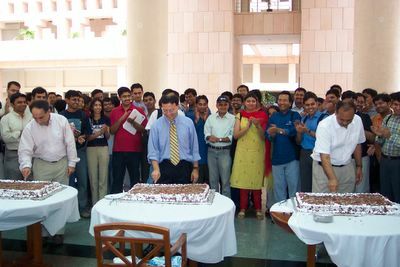 June 2005 – My Story – ISB and beyond !!! Three of the four Profs who taught us this term are leaving as their teaching engagement with us for this year ended today. I really liked Prof Anjani Jain. He is the vice dean of Wharton, has been teaching for about 19 years there and had been coming to ISB ever since its inception. The short speeches he gave today – one in the class and one just before the cake cutting ceremony were really inspirational. We had a small cake-cutting ceremony. Here is a snap from the same. Its been raining like crazy here for the past two days, especially in the evenings. Global economics mid term exam is scheduled for day after tomorrow ….. weather is so beautiful today ….. not in a mood to study but have to. There was a T-shirt design contest and we have almost finalized the design for our (first) section T-shirt. Keeping with the tradition, the color is black …… nothing more on this till the shirt is out. sleep – where art thou ? Assignment submissions continue and stretching into the wee hours of the morning is becoming more of a routine. My classes this term start at 8:30AM in the morning and lack of proper sleep over the past few days has been playing upon me. Decision models and Optimization is an interesting subject and Prof Anjani Jain teaches it really well. But his class is usually the first one in the morning and I am unable to concentrate due to lack of sleep. The only thing that seems to sympathize with us here is the weather. Its been drizzling intermittently and the weather is just perfect for doing anything other than studies. Markstrat results for the previous period are out and we did fairly well . Its too early in the day to conclude anything though. With decisions to be submitted twice a week, Markstrat is going to take away a significant chunk of our time. It was Prof Akbar Zaheer’s last class with us today. He is a good speaker and has lots of knowledge gained from extensive reading. But the one thing which I disliked in him the most was the excessive importance he gave to class participation. Some people were speaking just for the sake of speaking and asking some really common/stupid questions just because marks were at stake and because most of the others were asking questions too. Unregulated/excessive class participation results in a severe hit on learning. Its just 10 classes per subject per term and we usually have 2 professors coming one after another for most of the subjects. This means there are just 5 classes per professor and it is very important to get the most out of the really good faculty we get here, in these limited number of classes. In this regard, I liked Prof Rajeshwar Upadhyay, who took our leadership development programme in Term 1. With him, we had controlled class participation. He would also not take up questions in class once they started eating into the time planned for successive discussions. Class participation has never been this bad an issue till now as it has become in Prof Zaheer’s classes. Don’t remember doing anything else in the past week other than finishing assignments and submitting them one by one ……. and in case you just thought its all over, these submissions continue throughout the term. We have at least 3-4 assignments and 2 Markstrat decision submissions every week. There are at least 2-3 cases to be read and analyzed every week apart from the regular course readings. There is also a mid-term exam next week. Don’t know whether my brain will still be working when this term gets over. It managed to revive itself after Term 1 but Term 2 is even more pain. Prof Jagmohan Raju is throwing a party for us today. It is scheduled to begin in an hour. Booze n other beverages will be sponsored by Prof. Raju. We will have to pay for other eatables. Hope Prof Raju doesn’t start talking about the Markstrat decisions we took today. The rate at which we are slogging here, we would probably need such parties every week to avoid burn-outs. Planning to see a tam movie tonight after the party. Missing good old Delhi, all the people back home and most importantly my paychecks !!! There is a (emergency) power outage since morning here at ISB. This however didn’t prevent the professors from taking their classes. Our classrooms here are kind of closed from all sides, devoid of (openable) windows with just two doors for entry/exit. It gets really suffocating if the centralized a/c doesn’t work which was precisely the case today. We had both the doors kept wide open and also were given extended breaks inbetween classes to go outside to get fresh air. Gensets are running and we do have lights and fans working in the student villages. We can also access internet. A strange thing happened just sometime back when we were having dinner in the dining hall. The lights and fans which were being operated by gensets suddenly went off leaving us in total darkness. People took out their cellphones and kept the backlights on while having dinner till power was restored from the gensets. Memories of good old Delhi came back to my mind. We had long power cuts there so many times during the year that candle light dinner with the family was very common on such days, in case I came back from office early (read 9PM). The only difference this time is that we had a “mobile light” dinner here in place of a “candle light” dinner. Bad day … 8 hours of classes …… and then watched Sania Mirza go down fighting in the second round at Wimbledon. Kudos to Sania anyway …. she fought really well. Hope she gets a good trainer who can work with her on her shortcomings. She is sure to shine if she continues playing with such passion. Really tough days ahead. Markstrat is going to kill us, though it promises to be a very good learning experience. Lots of assignments to be done … its better I start something rightaway and try to do as much as possible before eyelids call it a day. He came, He taught, He conquered !!! We had our first class of Marketing Decision Making by Prof. Jagmohan Raju today. We had heard a lot about him and he was, in my opinion, simply too good !! Though it is somewhat early in the term, I would probably rate him higher than the marketing profs we had in Term 1, though they were also really good and impressive too. This is probably the first time that I have been totally engrossed in the class for the entire 2 hours without feeling tired or without feeling the need for a break (Prof Raju did give a break at half-time, though). Along with the ability to impress the students with his level of knowledge and experience (like Prof Scott Ward), he also has the ability to teach well (like Prof. Asim Ansari, who though was a bit too slow sometimes). I think we are really lucky to have Prof. Raju here. He had an accident 4-5 weeks back, had injured his knee badly and had been looking for a replacement to come and teach us. Lucky for us that he couldn’t probably arrange for one in such a short time span. The main thing to watch out for in his class is “Photo Cold Calling”. The class starts with questions about what we learnt in Term 1 and the student whose photo gets flashed on the slide has to answer the question asked. As Prof Raju put it, some students stop recognizing their own faces as time goes on. We had a case study submission to be done today morning. The case was then discussed in today’s class. It was about a projection systems manufacturer’s response to a unexpected move by a competitor. The case was an interesting one and I am very happy that I could think most of the things that the Prof mentioned in the class, before writing my plan. There were a few things the Prof mentioned which I had never thought about and in fact nobody had, at least in my section. These things will probably come through experience. I think I am now able to read marketing cases better. The discussion in the class was very interesting. We had to choose one of three strategies that the company should follow and Prof Raju divided us into three groups based on the strategy we had recommended. Each group had to convincingly defend its strategy. People could shift from one group to another if they felt any of the other two strategies was better. No switching happened in our section though, may be because people didn’t want to switch sides in front of the entire section (as remarked by Prof Raju) or because they were really convinced that they had chosen the better strategy or because no group could convince the other groups that its strategy was the better one. All said and done, life in this term is going to be really tough. We will soon start working on Markstrat, a strategic marketing simulation software and as its reputation goes, its going to eat into whatever is left of our sleeping hours. There are so many assignments to be done every week on the weekdays too. Last term, we mostly did assignments only over the weekends and so had at least some time left during the weekdays. Its really becoming difficult coping up with the daily readings and the assignments, especially for a “early to bed” guy like me. Cricket: Was shocked & surprised when I read on the net that Bangladesh beat Australia by 5 wickets. Would have been interesting to see the match. Seems like ages since I watched a cricket match on TV. The sports club prez has promised to show all major sporting events on the big screen. The Indianapolis Grand Prix is the next one in this series and will be shown in one of the student villages tonight. Kingfishers will be available for free. Saw two Tam movies this weekend. Manage to see at least one every Thursday now courtesy enthu Tam junta out here.